These basic cooking tips come in handy making your low carb lifestyle easier. We’re offering these basic cooking tips in the hopes of making the time you spend in the kitchen as pleasant as possible. Either for everyday meals or for your next party, the hints and tips here will be a great resource. Cooks who understand what they’re doing are more likely to enjoy cooking. Knowledge is critical when it comes to combining foods or choosing the right cuts of meat. And that’s just the beginning of what you can expect to find. We’ll have short-cuts, quick-fixes and lists of do's and don'ts when it comes to cooking low carb. Please enjoy and share these cooking tips with your friends. We know this section of the site will be very practical for all cooks at home. To simplify things, we’ve created specific links to cover as many topics as possible. Expect many more tips as the site continues to evolve. You can never have too many basic cooking tips or kitchen advice. I think the most helpful bit of advice I ever got was when I first started out really cooking for myself. And that bit of advice came from my now husband who said to purchase the best cooking tools that I could afford. So I invested heavily into very good knives, an assortment of pots and pans and dependable miscellaneous gadgets. My kitchen devices and tools are many years old and in great condition because I take care of them. Knives are hand washed to preserve the blades from pitting and losing their edges. 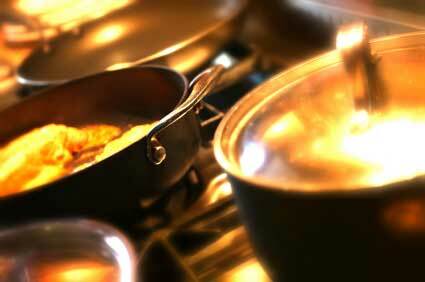 Non-stick pans are also hand washed to maintain the integrity of the non-stick surface. Washing wooden cutting boards immediately after use is also really important. Just don't soak it. Wash it well with dish soap and very hot water, rinse thoroughly. Then use a clean tea towel to dry it and then let it dry completely standing on its end rather than letting it dry flat. If you leave it flat, in time it will warp and become useless. Then every couple of weeks pour coarse salt over the board and rub it down vigorously with the cut side of half a lemon. Squeeze the juices out as you go. Then rinse really well. Wipe down with a clean tea towel and allow to dry upright. Once a month or so, treat the wooden board with bee's wax. I like to use Clapman's Beeswax Salad Bowl Finish. Apply it sparingly with a paper towel or soft cloth and rub it in following the grain of the wood. Then buff with another clean cloth. I've read that some people use nut oils but I wouldn't. It would be way too easy to unknowingly trigger a nut allergy in some sensitive individuals. And avoid olive oil or vegetable oil. They turn rancid in no time at all. Return HOME form Basic Cooking Tips.